This Saturday, Tibetans and supporters around the world, led by His Holiness the Dalai Lama, will observe a symbolic 12-hour fast. The Hague, 28 August 2008: The past months have seen increasing repression of and violence against Tibetan activists and their supporters. 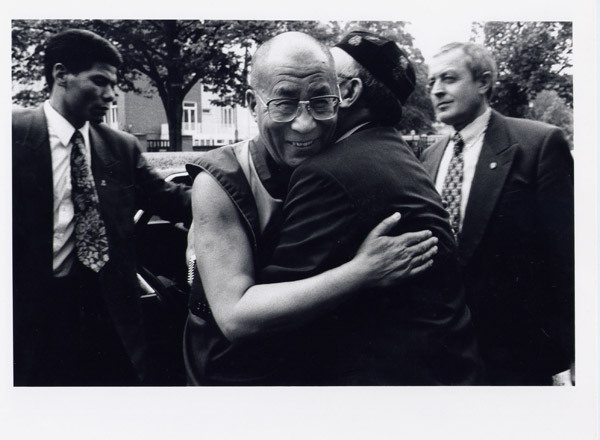 This Saturday 30 August 2008, His Holiness the Dalai Lama will lead Tibetans around the world in a symbolic 12-hour fast in solidarity. UNPO urges all Tibet supporters around the world to join the Tibetan community and express support for their nonviolent movement, and in memory of those who have lost their lives in recent months due to unrest in Tibet. UNPO sincerely extends our congratulations to Professor Venerable Samdhong Rinpoche, Kalon Tripa of the Tibetan government-in-exile, for this initiative. UNPO offers its utmost support, and hopes that its members will join in solidarity to support the ongoing struggle of Tibetans everywhere. "The world, at large, is plagued by hosts of problems such as poverty, violence, environmental degradation, religious disharmony etc., these are the reasons for various unending sufferings humanity is facing today, and will continue to be the reasons in the future too. For the last nearly sixty years, as a direct result of the [People’s Republic of China’s] ultra leftist policy and their discriminatory programs aimed at Tibetan Nationality and oppression of Tibetan people, hundreds of thousand of Tibetans have lost their lives and thousands of Tibetan cultural and sacred religious institutions have been demolished so far. Whether intentionally or unintentionally, the various policies and decisions that are currently being implemented in Tibet is leading to ‘Cultural Genocide’ in Tibet. Furthermore, the merciless and harsh crackdown on the nonviolent, peaceful Tibetan protestors since March this year  over demonstrating their deep anguish and aspiration has left many hundreds dead and thousands more injured, tortured and detained. Unfortunately, this unthinkable atrocity is still continuing unabatedly with the apprehensions growing about further intensification of repression after the Olympic Games. It is evident that, not just Tibetan, but the Chinese masses are also deprived of religious freedom and freedom of conscience and expression that can be understood from The Tiananmen Square Massacre and how the legitimate demands and grievances of many farmers and workers are meted with force and intimidation. To bring an end to such injustices, a 12-hour symbolic fasting shall be observed by all truth and justice loving people of the international community and, particularly, by Tibetans in exile and Tibet supporters everywhere on Saturday, 30 Aug 2008, which is the last day of 6th month in Tibetan calendar. This symbolic fasting, which will begin and end at 0700-1900 hrs, is done in order to purify oneself from negative actions and to accumulate good karma, to stress the non-violent perseverance in struggle for the ideals of freedom, justice, democracy, freedom of expression and for transparent political order for the whole world, Tibetans and Chinese people in particular. It is an appeal to all the justice, truth and peace loving people to effectively support such non-violent struggle and cause in whatever capacity.